Johnson Industries Model CJ-9600, stainless steel, commercial cheese shredder used for high-volume cheese shredding operations and allows you to process up to 40 lb (20kg) blocks of cheese for size reduction prior to grating and is rated up to 10,000 lbs of product per hour – depending on materials and application. 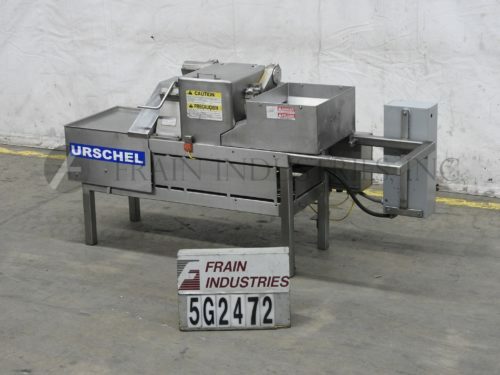 Equipped with dual 24" long x 8-1/2" wide x 8-1/2" deep dual product chambers slide open safety covers and (2) pneumatic _" diameter x __" long product pushers, 33" OD four blade cross cut shredding disc with safety cover. Control panel has regular blend, auto maintenance mode control dials and right / left pusher in / out switches with right / left air cylinder speed controls. Mounted on a stainless steel frame with casters.